I am on a photo frame kick – – this week it’s for Father’s Day! This is a fun Glass Etched Father’s Day Frame – perfect for dad’s desk at work or home or anywhere! 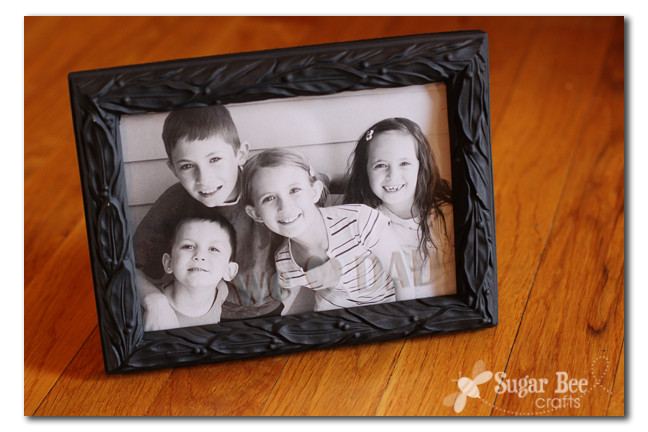 (remember last week I made a Mother’s Day frame – that’s why that picture of my kiddos is familiar). Um, yeah. We have four kids. And the youngest is 4. The picture’s “a little” outdated! Time to get him a new picture of the kids for his desk at work. And this makes the perfect Father’s Day gift! This post may contain affiliate links. —Glass Etch Cream – I’ve used both Armour Etch and Martha Stewart Glass Etch and like them both! –stencil – I cut one with my Silhouette machine using contact paper, but you can also use store-bought letter stencils, etc. I used transfer paper to move my contact paper stencil to the glass in the frame. If you’re using stencils you can just tape them down. Next, according to product directions, apply a thick even layer of etching cream over desired area. Let it sit for 15 minutes. Oh, I forgot to mention that I spraypainted the frame black. I didn’t mind the gold, but thought that in a work setting, the black was probably a better choice. I like how the frame has some detail to it and isn’t just plain – worth my $0.75. So — go grab a frame, and grab some awesome Etching Cream and crank out this fun project for Father’s Day! Mandy-this is such a cute idea. Thanks so much for sharing. That’s a fun Father’s Day idea! It’s so hard to make things for dad that are still manly, but the glass etching is perfect!!! And that cracks me up about the thrift store! Good marketing ploy there! Oh I love this idea on picture frame glass; I’ve never thought of that before! Awesome! I love etching cream…what an awesome idea, Mandy! I love the etching cream, and this is a cute idea!